BskyB buying The Cloud isn't interesting because it positions them to compete with BT for on-the-move wifi access. It's interesting because it positions both companies to be currently the only players in the next mobile market. What we quaintly call our mobile phones are increasingly obviously just sub-scale computers. On a train today I used mine as a 16 gig music player, a Twitter station, a Kindle and a text-messaging system. Next time I buy a phone it'll be the biggest tablet I can fit in my pocket - a reality Tmobile's data cap seems to obviously reflect. Or to put it another way, my need for mobile Internet access on my "phone" so vastly exceeds my need for voice telephony that the market BT, and now Sky, are getting into is the sort of universal Internet access both home and away that will form the basis of my next "mobile phone" contract. So it's a smart move from Sky, but not one to compete with BT so much as to join BT in eliminating Vodafone, Tmobile, Orange and O2 over the next few years. Voice is increasingly a needles luxury on a mobile phone, especially when it's still used to lock you in to long contracts that can be avoided by going without. Exciting claims at Carphone Warehouse: "FSA regulations require you to listen to my insurance sales pitch"
I've bought about twenty mobile phones in my life, I kind of know how the process goes. So buying a new phone earlier today from Carphone Warehouse, it went normally and unproblematically until we came to the part of the sale where the sales guy tries to sell me insurance I don't need and I stop him as quickly as I am politely able. It's not a big deal; he's been told to sell it to me, there's no chance of me buying it, we just need to get through a few seconds of it so he can tell his boss he tried. Today though, a new and exciting twist. As he started the usual pitch and I stopped him, he said "FSA regulations require me to tell you this". Now, here's a thing. That simply isn't true. There's no FSA regulation that requires a mobile phone customer to hear a pitch for insurance. I pointed this out twice and he continued to claim it, until finally I told him I wanted to record him saying that FSA regulations required me to hear an insurance sales pitch and got my (old) phone out ready to do just that. At this point, of course, it turned out that FSA regulations didn't actually require anything of the sort - the company just happens to be regulated by the FSA and it's the company that requires him to tell me about the insurance. Perhaps it's not a big deal, and perhaps I should be older and more cynical by now, but really... claiming that the financial services regulator is making you flog your customers financial products they've clearly and distinctly said they don't want is a new one on me. Yes, it is very shiny. Thanks for asking. "Thank you for your inquiry. Amazon believes it is censorship not to sell certain books simply because we or others believe their message is objectionable. Amazon does not support or promote hatred or criminal acts, however, we do support the right of every individual to make their own purchasing decisions." And yet, a matter of hours after defending their sale of the book with this clear statement of policy, Amazon pulled the title, apparently in response to a widespread outcry amongst customers and commentators, and it remains off the shelves. Amazon has not replied to questions as to what happened there. I missed this when it was announced last month - TomTom, the GPS guys, announced a system called "MapShare" that lets any user of their GPS technology update a map and then share it with another user. This doesn't quite make TomTom an open mapping solution like Open Street Maps, but adding peer-production and collaboration functionality to a portable, GPS-enabled device is a big step in opening up maps. Inevitably described by TomTom as "navigation2.0" the system doesn't let users change street geometry, but they can add instructions, change the name of a street, reverse the direction of a one-way route etc. 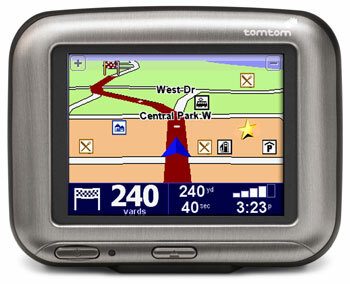 More reviews and commentary at GPSlodge and an interview with Tomtom's CEO at Engadget. For all I know you read it here first: I've just come across a new app that solves the real local/entz problem of quickly finding film listings for multiple cinemas. (Currently UK only.) 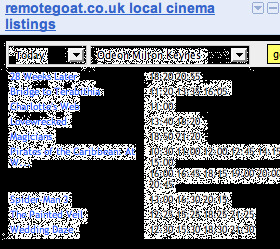 The remotegoat.co.uk UK cinema listings tool is a Google app that can apparently be added to any personalised Google page (for which there are, says that most impartial of sources Google, tens of millions of users). The problem it solves is trying to view listings at multiple cinemas belonging to more than one chain, which in the past I've found absurdly inconvenient as I've had to navigate around the various cinema chain websites. It's a nice bit of kit, but I mention it here mainly because it fixes a problem with cinema listings that I've battled with every time I've wanted to see a film and if you're based in the UK and have encountered the same problem you'll probably find it useful too. Be nice to see more applications though - a Facebook app, tags for embedding it into any webpage, perhaps soon a MySpace app too. So...anyone who reads this blog, has an even passing interest in media/strategy/tech and works in/ ever passes through London should really pop along to Umair Haque's "weekly get-together for investors, entrepreneurs, analysts, and people interested in next big things", now called Next Wednesdays (formerly "Innovation Wednesdays"). This week I'm told it will be held on Thursday 7th December at Coco Momo and (barring unforeseen disasters) I'll definitely be going along. You can see a review of the sort of things I get out of these events here. You can see the Next Wednesdays website (designed by Paul Pod of Tioti and Zopa fame) here. And - because I fully believe Umair's theory that a lot of value is created online by reducing search costs for users - here's a photo of Umair so you won't have to wander round the pub asking everyone whether they're him. Netcoalition.com, a lobbying group led by Yahoo! and Google, is protesting at proposed price increases by the New York Stock Exchange (Times) for its real-time data. Over at the Guardian Roy Greenslade argues that "data must be free" and concludes "I'm with Google on this". Just this once, I am not. This is one of the rare exceptions to the rule that the web has made information free and universally accessible. To quote Stewart Brand (unusually, in full), "on the one hand information wants to be expensive, because it's so valuable. The right information in the right place just changes your life. On the other hand, information wants to be free, because the cost of getting it out is getting lower and lower all the time. So you have these two fighting against each other." There are two points I'd like to make here. One is that the NYSE is not a public service: it is a business that provides a valuable service, a marketplace for the transacting of shares. By creating this marketplace it creates value for all of its users, and for providing this facility it takes various cuts, including a fee for access to real-time prices. Much as eBay takes a fee for hosting and making available its marketplace for transacting merchandise, the NYSE wants to be paid for putting buyers in touch with sellers. I'm inclined to say fair enough. The second point is this. Real-time share prices (rather than prices delayed by a mere fifteen minutes, the distinction that is being debated here) are useful for one thing - trading that share. If you want to buy or sell a share, you need to know the price you'll buy or sell it at. But you can't buy or sell shares directly through Yahoo! Finance or at Google - for that you need a stockbroker, and once you've signed up with a broker they'll provide you with real-time prices as part of the package. No problem. (And in fact even real-time prices aren't enough to trade on - for that you need things like the spread and the order book, but no-one seems to be arguing about that.) Real-time share prices are the sort of information that wants to be expensive because in the right place it changes your life (or at least your fortunes). That's what - indeed that's all - it's for. If you just want to know roughly how a share is performing...well, prices delayed by fifteen minutes are perfectly adequate in all but the rarest circumstances of unexpected calamity or unexpected triumph. Now, at this point eagle-eyed readers might point out that those are precisely the circumstances in which investors need to know exactly what's going on in real-time - but in fact no, anyone actually holding shares (and who has the vaguest idea of what they're doing) will use something called a stop/loss order, an instruction to their broker to automatically buy or sell if a certain price is reached. So what consumer right is Google and Yahoo! 's coalition campaigning for? The one need consumers could really have for that data - buying and selling shares listed on the NYSE - is already met for them by the stockbrokers they have to use to make those trades. The web giants are, I think, really arguing about two things and neither of them are a matter of consumer protection. One is, perhaps, a sincere matter of principle - there are many people at Yahoo!, Google and elsewhere who passionately believe that information wants to be free, even if the information in question is expensive for someone else to collect and disseminate, perhaps even if that information really isn't of any practical use. It just "wants to be free" as a matter of principle. But the other is a matter of simple economics. The NYSE controls that data and when it raises the license fee for it takes money from Yahoo! and Google and keeps it for the New York Stock Exchange. That, I suspect, is the principle most painfully at stake for the members of Netcoalition here. A month or so ago I noted that Microsoft's latest search innovation looked remarkably like the excellent Rollyo. Today, Steve Rubel notes that one of Google's many recent innovations looks a lot like Rollyo too. That's two more people copying rather than buying a good idea than you'd usually expect. Maybe in Rollyo we have found that most rare and wonderful of things - a web2.0 start-up that wasn't set up in the sole hope of a quick sale to a portal? Some little way in to the web's second decade and we finally understand that the digital revolution is about unbundling - about selling (or giving) consumers the packets they want rather than the packages we once happened to bundle those in. Op cit the phenomenal success of iTunes in selling listeners the individual tracks they want rather than the CDs those tracks happened to be arbitrarily packaged on by the bands and/or the record labels. Hence indeed the runaway popularity of news aggregators with digital natives who want to see the packets of news that matter to them but won't pay for a package of news - a newspaper - that happens to contain a few snippets about their interests but also four hundred pages of stuff they don't care about. Unnecessary middlemen everywhere are losing ground, and nowhere is this as apparent this week as in the rush by American TV to digitise its offering and get it online. ABC has been using iTunes to distribute individual programmes as paid-for packets for some time now, and the latest figures indicate that some five million downloads generated $10m for them in revenue. Fox is the latest bandwagon-leaper, also announcing (Reuters) a plan to distribute its content over iTunes, and Warner has come up with the rather more innovative notion of using the peer-to-peer BitTorrent network (BBC) for its own digital distribution strategy. But the biggest news in this round of the scramble must surely be the NBA's plan (Micropersuasion) to deliver match coverage via iTunes. That's not Fox or ESPN offering basketball matches online, note...that's the NBA, the national basketball association itself. Disintermediation? We haven't even begun. Yahoo! Sports is already (PaidContent) airing webcasts of some National Hockey League games. Amidst all the sound and thunder (TMCnet) surrounding the auction of the Football Association's rights to UK football matches there is a more important, longer-term question. Sky has just secured the right to four out of the six premiership packages until 2010. By the time 2010 rolls around, will the FA even need a "broadcast" distribution channel like Sky? And has Sky secured an incredibly prescient commercial and technical coup by locking down the football league content for four years just as (Buzzmachine) everything explodes? The question of the FA distributing match coverage themselves, without the need for an intermediary (except perhaps as a payment mechanism and aggregator such as iTunes) is very evidently now a when rather than an if.